First reported by the Wall Street Journal, Nintendo can't keep up with demand for the Switch because orders for Toshiba's NAND flash memory is exceeding supply industry-wide. Cited as major factors for the limited chip supply are Apple's production of the iPhone 7 and future unnamed models, other smartphone manufacturers, and data centers. Asked for comment, a spokeswoman at Toshiba said that demand for the storage chips are "overwhelmingly greater than supply" at present. The situation is unlikely to resolve itself in 2017, according to Toshiba. While Nintendo is no stranger to short supply at retail by accident or design, the company claims that it hopes to build 20 million units of the Switch before March 2018. Nintendo reportedly fears wide-spead "customer tantrums" should it lack available stock for the 2017 holiday season. The Nintendo Switch launched in March, and is a touchscreen tablet with attachable controllers to the left and right of the screen. 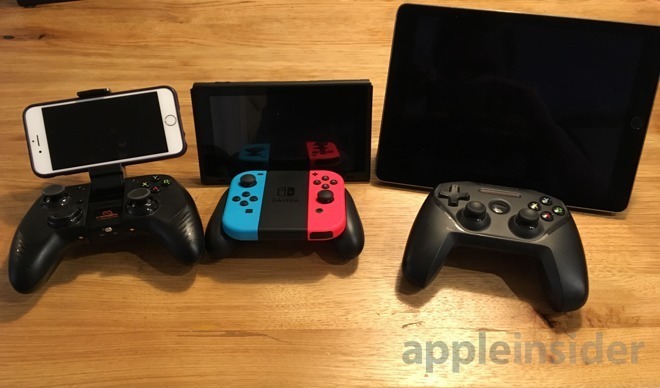 The device is set to feature integration with an official Nintendo app for iOS, though it is not yet available at launch. The $299 console shipped around 2.74 million units in the first month of its launch, besting Nintendo's projections of 2 million units. It remains heavily constrained at retail. Nintendo shipped 13.56 million of its predecessor, the Wii U.